With numbers moving all over and people spinning the polls, I think we're all getting nervous about wht'a going to happen on election night. But here's a little something that might make you feel better. Perhaps the best way to get a sense of what's happening is to look at the state level, and specifically, to look at the *trend lines* - which states are MOVING in these last days towards McCain, which to Obama? September, with the market meltdown, shifted trendlines dramatically towards Obama in most of the blue-collar swing states. October, as McCain started hitting hard on his terrorist, socialist, Joe-the-plumber race-baiting attacks on Obama, again, some states responded and started moving back toward McCain. No state exhibits this trend better than West Virginia, which had Obama leading in September then had McCain turning around and leading again in October. Obama needs to worry about states like this, where the McCain red meat speaks to voters. In addition to West Virginia, there seems to be a similar response in states like Pennsylvania, Texas, Wyoming, Kansas, and Nebraska. Sure, McCain is smart to take advantage of this trend in Pennyslvania and try to make the most of it. Those other states, however, give him little, since they have long been deep red to begin with. But the states McCain needs to worry about are those susceptible to the September movement, but not responding to the October push back. These are states like North Dakota, Montana, South Dakota, Nevada, Colorado - states with small African American populations where Obama did well in primaries - and states with significant African American populations like Georgia, Mississippi, Missouri, and Virginia. 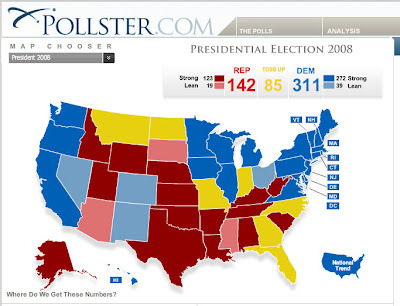 These states are still showing consistent movement towards Obama since September, with no effect from McCain's attacks. Those states where he's winning he's winning by wider and wider margins. Those where he's losing are getting closer and closer and could end up being swing states by election day. Unless McCain can turn that momentum around somehow, it's hard to see how he wins even if he does get the additional ten points he needs to take Pennsylvania.